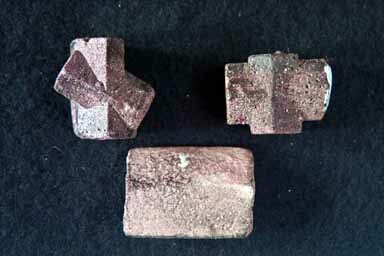 Staurolite is best recognized as stubby, elongate, brownish crystals that are crossed (twinned). The upper two specimen show two kinds of crosses, while the lower specimen is uncrossed. Yellowish brown, reddish to brownish black; vitreous (glassy) luster; stubby, prismatic crystals with pseudo-hexagonal cross section; hardness 7-7.5; poor cleavage lengthwise.